Windy and wavy from the get-go, PRO and race organizer Simon James staged three different starts and set three different courses for the third day of the 2018 Bay Regatta. Racing & Cruising A’s start was followed by Cruising B and Bareboats’, and then Racing and Cruising Multihulls. Course-wise, the Racing Class and Racing Multis were off on the longer 24NM course, while the two Cruising classes hit the 17NM course and the Bareboats & Cruising Multis sailed a 14NM route. All finished off of Railay Beach in Krabi. With its second consecutive first-place finish, Sergey Khamstov’s Megazip won the Bay Regatta’s Racing Class; Uminoko, skipped by Vitalii Plaksin, third-place showing on the day saw it jump to second overall with Steve Manning’s Red Rum settling into third spot and Gary Baguley’s family on Fujin holding the last position in the four-boat class. Manning, won the 2016-17 Asian Yachting Grand Prix on the Ker Custom 42 Black Baza, which he co-skippered with Anthony Root. In the Cruising A class, Niels Degenkolw’s and his women’s’ team second-place finish today kept Phoenix in first overall, Palleschi’s Prime Factor third-place showing allowed them to keep a stranglehold on second spot in this eight-boat class while Paul Merry’s Night Train snuck into third overall by winning the class today. Cruising B saw Ket Mangklaseranee’s Marigold hold onto first overall, by claiming victory for the second straight day. Mig Wehrle’s Aqua stayed in second overall by finishing third today while Paul Baker’s Isabella moved up the leader board to third overall with a second-place finish today. If this regatta was determined on elapsed time alone, Fugazi would have won it a few seconds into race day one. Taking line honours for the third straight day with a time of 02:12:20 (corrected time was 02:17:30) was good enough for another third-place finish. Twin Sharks gave them a run for the money throughout the day, crossing the finish line a few minutes behind Fugazi, solidifying their hold on first spot overall, Asia Catamarans Hurricane and Blue Nose, sit second and third overall and it will be a battle royale across Phang Nga Bay tomorrow as the racing multis head back to Ao Chalong. The Bareboat Class saw Denis Aksenov’s Venture George Brown’s Kinnon, battle it out again with Venture holding a one-point lead heading into the final race day. Russell Waddy’s upset victory on day three saw them move into third overall. Multihull cruising saw Robert Hossack’s Raptor 2001 beat Rick Fielding’s Mojo for the straight day by almost 12 minutes on corrected time. The Bay Regatta was founded by a photographer (John Everingham) and friends (Chris Schaefer and Andy Stephens). 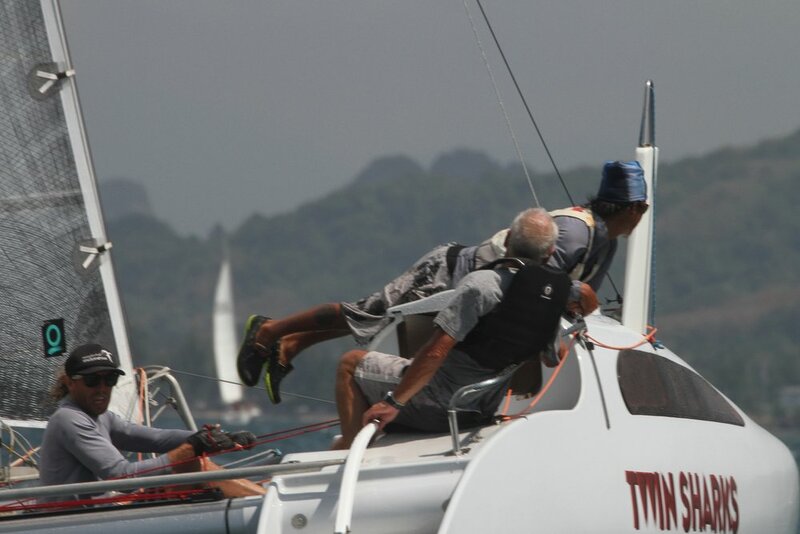 Everingham, a long-time Phuket King’s Cup Regatta committee member, was motivated in part by frustration at the annual struggle over setting that regatta’s courses. On the one hand, he wanted to shoot the fleet of sails contrasted against the dramatic scenery. The hard-core sailors, on the other hand, wanted their boats as far away from land as possible to avoid fickle winds. Dramatic photos would attract more sponsors, argued the photographer; but the sailors always won. So the stymied lensman rounded up some like-minded friends and established a regatta designed to sail among the dramatic limestone island towers and mainland forests of the waters off Phuket’s east coast. The problem was that the courses would go too deep into the Bay, where the wind didn’t blow. So when the Ao Chalong Yacht Club (now the Phuket Yacht Club) gained control over the regatta a couple years back a compromise was worked out between beautiful scenery and good sailing courses. The ACYC, and its volunteer board, however, felt it could not properly run the regatta properly, so five years ago it was handed over to “Mr Regatta” himself, Simon James of Regattas Asia. Simon, who aside from being the PRO of the Regatta for many years, had also been one of its principle organizers along with his partner Kae Wattana, so they knew exactly what they were getting into. Co-Sponsors: Chang Beer Tourism Authority of Thailand, Thai Beverage Public Company Limited, Chang, Mekhong, the Shellsea Krabi, and Raymarine, Budget Car & Truck Rental. Regatta Partners: Jungceylon, Phuket Boat Lagoon, TIPLife, Chandara Resort & Spa, Kan Eang II, Haadthip, O2 Beach Club, Tonsai Marine Services, East Marine, Port Takola, Koh Yao Chukit Dachanan Resort, and Ao Nang Villa. Local Supporters: B & G, Infinity Communications, Prestige Marine, Octopus Marine. The Mangosteen Resort & Spa, Electrical Marine and Epic Charters. 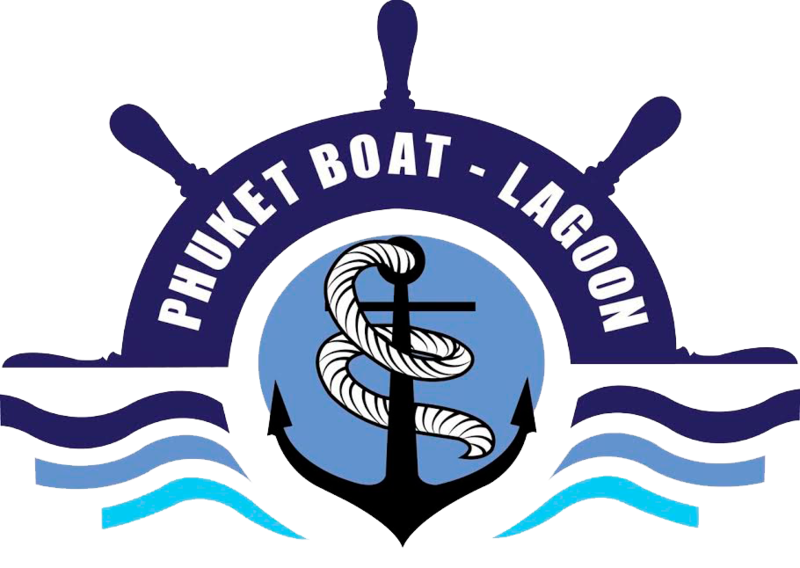 Media Partners: The Phuket News, SEA Yachting, One Coast magazine, Check In - Surat, MDA, aBoat. 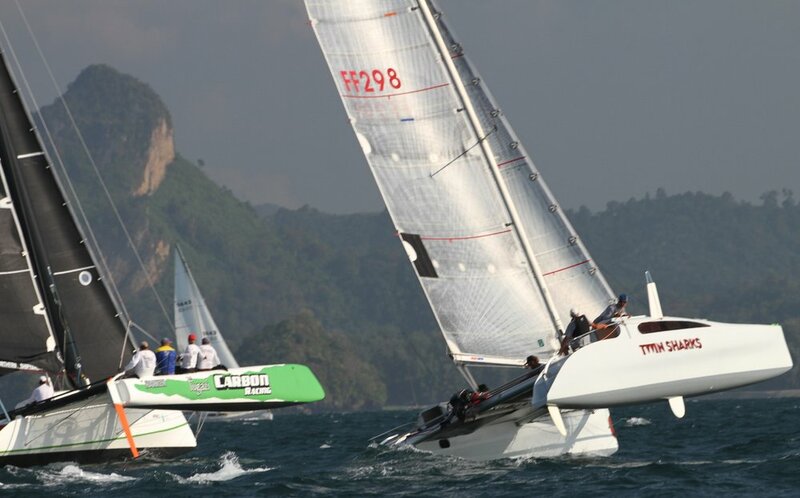 The Bay Regatta is organised by Regattas Asia under the auspices of the Phuket Yacht Club in conjunction with the Yacht Racing Association of Thailand, the Province of Phuket, the Province of Phang Nga and the Province of Krabi. For more information, visit www.bayregatta.com or www.facebook.com/bayregatta (Detailed courses can be viewed at www.bayregatta.com/courses). Regattas Asia is a brand name of Phuket and More Co. Ltd., established in 2001 with over 15 years’ involvement in the organisation of leading marine events in Asia. Regattas Asia has become a prominent player in Asia's regattas industry, with an innovative approach to the management of major sailing events in the region, and provides services to the following events: Phuket King's Cup Regatta, Cape Panwa Hotel Phuket Raceweek, Sabang International Regatta (Indonesia), Royal Langkawi International Regatta (Malaysia), Hainan Around the Island Regatta (China), China Cup International Regatta. Yesterday’s Jungceylon Race Day from Ao Po to Koh Yao Noi was followed today by Raymarine’s Race Day. Participants in the 21st Bay Regatta continued to enjoy great sailing weather as the party that sails around continued to do just that. PRO and race organizer Simon James again staged two starts for the competitors today: first off were all the monohulls followed by all the multihulls, and again there were no major incidents to report – just a nice clear spinnaker run down Phang Nga Bay. The four-boat Racing Class saw the boats have identical 1-4 elapsed and corrected times order as Sergey Khamstov’s Megazip came first, followed by Steve Manning’s Red Rum, Aussie Gary Baguley’s family on Fujin in third and Uminoko skipped by Vitalii Plaksin in fourth. In Cruising A, Niels Degenkolw’s and his women’s’ team on Phoenix continued to dazzle and turn heads, claiming first overall, finishing twenty-five minutes ahead of Aussie Palleschi’s Prime Factor on corrected time and even further ahead of Russian Kirill Stashevskly on his new boat Jing Jing. Kirill competed for many years in this regatta and others sailing the stealth catamaran, Gale Force. Cruising B saw the results flip-flop from yesterday with Ket Mangklaseranee’s Marigold taking first from Mig Wehrle’s Aqua (Mig had his wife and young child on board) with Paul Baker’s Isabella coming in third. The Bareboat Class saw Venture’s wildly excitable crew skippered by Denis Aksenov finish three hours ahead of Kinnon, helmed by George Brown. Line honours again went to Fugazi with a time of 03:08:18, which became 03:15:39 on corrected time, good enough for third spot on the day. Asia Catamarans Hurricane and Twin Sharks flip-flopped their positions from yesterday with Alan Carwardine’s crew taking top spot on this day. Multihull cruising saw Robert Hossack’s Raptor 2001 beat Rick Fielding’s Mojo by 12 minutes on corrected time. Co-Sponsors: Chang, Tourism Authority of Thailand, Thai Beverage Public Company Limited, Chang, Mekhong, the Shellsea Krabi, and Raymarine, Budget Car & Truck Rental. Fugazi, helmed and recently sold by builder Danny Moore, took advantage of some good early wind to fly through the course on day one of the 2018 Bay Regatta taking line honours in 3:50:02. On corrected time, with her handicap, this ended up being a time of 3:59:19 (for seventh spot in her class), but boy, did Fugzai catch good wind as she soared through the stunning karst topography. The actual race started at Koh Naka Yai, then the participants sailed north leaving Koh Phanak and Koh Na Ka Ya to port before rounding the first mark, northeast of Koh Yai, to starboard and then passing Hin Mot Daeng to port and Koh Batang to starboard before finishing off of Koh Kudu Yai – approximately 17 nautical miles in length. PRO and race organizer Simon James had two starts for the competitors today: first off were all the monohulls (21 boats) followed by all the multihulls (12 boats). There were no real glitches, or incidents, on the course as sailboats deftly dodged the longtail fishing boats and fishing lines as they made their way across Phang Nga Bay. As time progressed and the wind died down, the course was shortened to approximately ten nautical miles for the cruising B, multihull cruising, bareboat cruising classes. In the Racing Class, Russian boats have proved to be the class of the fleet the last few years and today was no different. Uminoko skipped by Vitalii Plaksin was third across the finish, but on corrected time took first overall. Megazip (a former Bay Regatta winner), skipped by Sergey Khamstov placed second overall with Aussie Gary Baguley, sailing with many of his family members on board Fujin, coming in third on corrected time. Steve Manning’s Red Rum took last spot four-boat class on the day. In Cruising A, Niels Degenkolw’s Phoenix, who was won this regatta numerous times claimed first overall with his all-female crew, finishing fifteen minutes ahead of Aussie Palleschi’s Prime Factor on corrected time with Stanislav Pechenkin’s Russian crew Southern Breeze 3 coming in a distant third in this eight-boat class. Cruising B saw Mig Wehrle’s Aqua beat Ket Mangklaseranee’s Marigold on both elapsed and corrected time as these two boats were the only ones to finish racing on this day as Greg Brennan’s Toot Yai and Woodrow Christensen’s Linda retired due to light wind and Isabella a late replacement for Farrgo Express, who damaged her rudder entering the passage to Ao Po last night, registered a DNF. The Russians were the only nationality to take two classes on the day also capturing the Bareboat Class with Venture skippered by Denis Aksenov finishing three hours ahead of Kinnon, helmed by George Brown. Andrew McDermott’s Fei Jian and Russell Waddy’s AllSail Kingman retired due to light winds. John Newnham’s crew on Twin Sharks has been together a long time and they just know how to get it done. Though they finished second on elapsed time (5 & ½ minutes after Fugazi); when the handicap was applied they claimed first overall in the Multihull Racing class. Asia Catamarans Hurricane, who were third on elapsed time, finished second overall on day one in the ten-boat class, while Blue Nose snuck into third spot. Multihull cruising saw Robert Hossack’s Raptor 2001 finish almost five minutes ahead of Rick Fielding’s Mojo on corrected time; the two boats have a strong rivalry, as they battle it out in many Phuket regattas and will duke it out again in this two-boat class. Regatta Partners: Jungceylon, Phuket Boat Lagoon, TIPLife Chandara Resort & Spa, Kan Eang II, Haadthip, O2 Beach Club, Tonsai, East Marine, Port Takola, Koh Yao Chukit and Ao Nang Villa. Media Partners: The Phuket News, SEA Yachting, One Coast magazine, Check In, MDA, aBoat. The Bay Regatta is organised by Regattas Asia under the auspices of the Phuket Yacht Club in conjunction with the Yacht Racing Association of Thailand, TAT, the Provinces of Phuket, Phang Nga and Krabi and Thailand’s National Parks Authority. New routes and exciting new venues have been announced for the 21st Bay Regatta (31st Jan - 4th February). This years racing will start from Chandara Resort and Spa located at Ao Po, Phuket. The fleet will race on the traditional route through PhangNga Bay to the East of Koh Yao Noi. From the finish line, the fleet will then head south and anchor in the sheltered channel between Koh Yao Noi and Koh Yao Yai. With a first night presentation party at Koh Yao Chukit Dachanan Resort on Pasai Beach. Day 2 will take the yachts racing through the Koh Hong Group, passing the Royal Palace and finishing close to Ralaee Beach for the popular "free night" in Krabi. Day 3 will take the yachts racing around the Ko Dam Group of Islands, finishing off Ao Nang. With competitors heading ashore for a presentation dinner at the new five-star The ShellSea, Krabi,located near the famous Fossil Shell Beach, one of only three known such geological formations in the world. Day 4 takes the yachts back across to Phuket, via Koh Yao Yai for a final nights presentation dinner at Kqn Eang II in Ao Chalong. Registration, Skippers Briefing and Opening Buffet - Chandara Resort and Spa, Ao Po, Phuket. Day 4 - Race from Krabi to Ao Chalong Bay, Phuket. - Closing Dinner Kan Eang II, Ao Chalong. With the Chinese New Year Holiday coming in the middle of February, the dates for the 21st Bay Regatta have been announced as 31st January - 4th February 2018. The Schedule will be announced in the near future. The fourth and final day of The Bay Regatta, the Chang Beer Race Day, saw all the fleet sail a short loop around islands off Krabi’s Railay Beach before heading out for a straight shot back to the southern end of Koh Yao Yai with the racing boats doing a slightly longer course than the cruisers. After crossing the finish, all boats headed back to Phuket where they celebrated the final prize-giving and dinner at iconic Kan Eang 2 Restaurant overlooking Chalong Bay. Already decided before the last day, Aleksandr Trofimenko’s Megazip decided to enjoy the scenery a little too much on the final day and opened the door for Gary Baguley’s Fujin to take their first win of the series – a consolation prize which left them in second overall behind the victorious Russian crew. With wins on days three and four Hellmut Schutte’s Aquavit 6 took top spot in Cruising A finishing with seven points overall. They were followed by Gary Smith’s Baby Tonga (10 pts), but it might have been a different story if Baby Tonga hadn’t accidentally sailed the wrong course on day three. “Ifs” however don't calculate, and Aquavit 6 claimed the top prize with Gavin Wellman’s Rascal placed third overall. In the final race for Cruising B, the Gillow-skippered Poco broke Canadian Jim “Yee Haw” Ellis’s stranglehold on first-place finishes, but it wasn’t enough to wrestle the overall title from Remington, who finished on seven points, with Poco on 10. Jim was able to add another notch to his The Bay Regatta belt as no one has won has won a class at The Bay Regatta as many times as Jim has. Piccolo (12 points), Aqua (14 points) and Thalassa (17 points) rounded out the class. A clean sweep for Kinnon skippered by Stanislav Pechenkin, saw them the runaway Bareboat Class winners with Alan Bower’s All Sail Asia in second and Russel Waddy’s All Sail Venus Hunter in third. In Racing Multihull Class, Fergus Wilmer’s team on Thor (Fergus and Jenny Wilmer, plus Warwick Downes and James Haste) claimed line honours each day flying around the course at a blistering pace, and again on the final day they claimed line honours in a time of 02:55:08. Thor and John Newnham’s Twin Sharks team of Alfie Rowson, Jason Corall, Tam Keawwantha, and Mark Pescott, ended up tied with seven points each but Twin Sharks won the class on the virtue of its three first-place finishes, which included their final race win by just 38 seconds on corrected time—it doesn’t get much closer than that. In this eleven-boat class, Alan Cawardine’s Asia Catamarans Hurricane finished third overall followed closely by Mick Coleman’s sister ship Java, in fourth. Multihull Cruising saw Rick Fielding’s Mojo and Sergei Dikanov’s Fenix flip flop first-and-second place finishes throughout the regatta both finishing with six points, but Mojo took the win, based on the results of the last race. Colin Wright’s Swift and Graham Tucky’s Optoloi II came next each with eighteen points, but Swift took third based on the its final-race performance, The Chinese Sanya Yomovo sailing team on DaVinci, had a DNS on the third day and a OCS on the fourth day (they didn’t have a radio on board) relegating them to fifth overall with twenty points. Simon James, who has stepped in many times to save this regatta over the years, did a tremendous job as PRO setting the courses, manning the starts and keeping things in order while his team on the water—Susan, Susie, Cathy, Chandran and Ron—as always, made sure all the starts and finishes were correctly posted and recorded. Kae Wattana and her Regattas Asia team made everyone happy on shore, providing plenty of good food and drink, and good entertainment. Sean Getchell’s Epic Charters stepped up and provided a superb committee boat, Hakuna Matata, and Tristan Hinxman did great work steering the photographer’s rib, graciously provided by Raymarine’s Mick Kealy.